Through a period of almost two weeks that included hard work, care, connections and a little bit of luck, a group of people in the United States have brought relief to almost 1,000 horses– the majority of them thoroughbred racehorses, stabled at Hipodromo Camarero Racetrack in Canovanas, Puerto Rico. The track was hit hard by Hurricane Maria. Collectively, what these people did was nothing short of amazing, according to Dr. Scarlette Gotwals, Operations Manager of Pennsylvania-based Horse America. Gotwals became an integral part of the process. It started initially Sept. 25 when Dr. Barry Eisaman of Eisaman Equine in Ocala, Florida, called Gotwals on behalf of the Ocala Breeders Sales Company, which wanted to send horse aid to Puerto Rico. Eisaman figured Gotwals had the tenacity and knowledge to figure out how to do it. Through dogged persistence, Gotwals was able to contact the contractor of the air charter service for all the flights handled by the Federal Emergency Management Agency, which required special permission to land in San Juan. Gotwals was subsequently introduced to some other people who helped significantly in the process: Erin Crady, Executive Director of Thoroughbred Charities of America; Keith Kleine, Director of Industry Relations of the America Association Equine Practitioners; and Jonathan Cutler, President of Ranch Aid. The cost of booking a 747 charter was $175,000, which was exorbitant, and needed to be done in a hurry because these types of flights are snapped up quickly when it is a disaster situation. Because of Gotwals’ connections with John Cuticelli, Founder/ChaIrman of The Ark at JFK– the world’s first privately owned animal airport terminal–she was introduced to Phil Jensen, the Vice-President of Business Development and Industry Relations for Consolidated Aviation Services. The Ark at JFK donated 20,000 feet of warehouse space to stage supplies that would be shipped. “Phil and I were talking about five to 10 times a day because we kept trying to get charters,” she said. After a few days of frustration, a break came through when JetBlue Airlines sponsored a 747 flight with Atlas Air as the carrier. JetBlue’s Eric Cintas and Renee Roth were particularly instrumental in providing the flight. “JetBlue recognizing the need to help the horses that hadn’t gotten any feed and allowing us the honor of being part of their charity flight was just incredible because it’s very expensive to fly,” Gotwals said. Gotwals was told by Atlas it had room for 25,000 pounds of space, and she agreed even though to that point very little supplies had been officially secured. Gotwals called her local Purina dealer, and along with Kleine, who was calling his Purina connection, they were able to find a farm, Heidel Hollow Farm in Allentown, Pennsylvania, that had compressed hay. Heidel Hollow regularly shipped to the islands. That happened late in the day Oct. 5, and Gotwals had to have the load sent to JFK the next morning. But Heidel Hollow had no trucks to deliver the load, so Gotwals recruited a person from the freight division of her company to go to Allentown to retrieve the load. Through a grant, Kleine was able to pay for it. Subsequent to that, Gotwals was informed by Atlas Air it could take on additional 25,000 pounds. 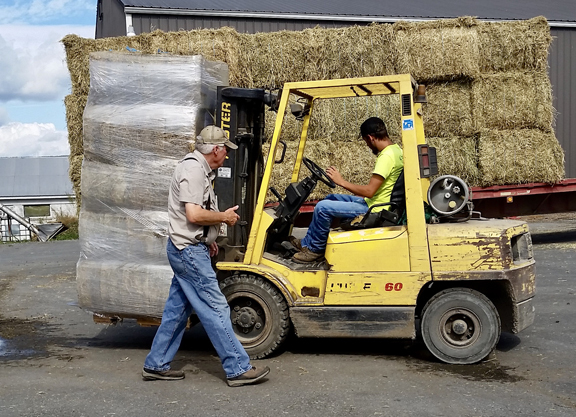 Close to 50,000 pounds of hay products was accumulated in less than 24 hours from not having anything prepared and ready to go. Included in the load was hydration hay cubes for horses that are convalescing and don’t eat or drink well. The cubes are placed in five gallons of water, which might have a foul smell because of the devastation, and becomes a nutrition drink. The shipment was sent Oct. 7. The plan is to book another 747 this week to send a second shipment, which would include veterinary supplies, but that will require additional fundraising.